At a glance, traditional Thai massage looks like yoga done to the customer complemented by acupressure. In many ways, it’s an accurate observation, as traditional Thai massage traces its roots from millennia-old Indian Ayurvedic and Chinese medicine. The proximity of Thailand to China and the arrival of Buddhism from India meant that some aspects of Thai culture were borrowed from Chinese and Indian practices. The Thais’ ancient healing traditions are part of their culture where these two influences can be felt. Central to the concept of traditional Thai massage is the release of the vital life force called ‘lom’ by stimulating the invisible energy pathways called ‘sen’ to remove the blockages, in the same way that Chinese energy meridians are stimulated by pressure and puncture to realign the person’s ‘qi’ or life-energy. As to the Indian influence on traditional Thai massage, hatha yoga may be the most visible. This is because hatha yoga is mostly about finding mental balance (in preparation for meditation) by releasing tensions and traumas that the body has accumulated over time. 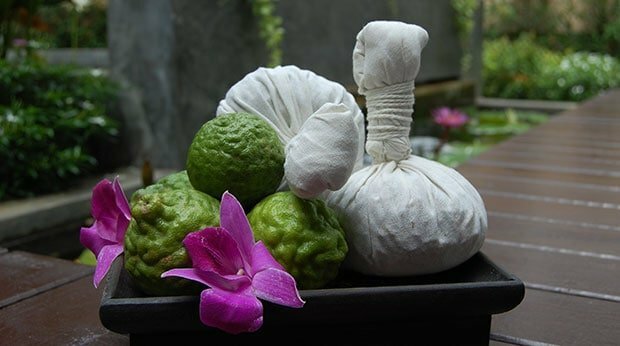 Today’s traditional Thai massage is a product of Chinese and Indian healing philosophies infused with indigenous Thai healing traditions that have been handed down over the centuries through oral traditions taught in ‘wats’ or Thai temples. For many centuries, Buddhist monks played the role of healers because they had access to this body of knowledge, and people would go to temples to seek relief from their physical afflictions. The 1767 Burmese invasion of Ayutthaya, however, nearly wiped out this ancient curative art, prompting King Rama III in 1832 to institutionalize the surviving knowledge of ‘sen’, therapeutic points and herbal remedies in stone epigraphs now on display at the Wat Pho temple complex in Bangkok. This is why Wat Pho remains a reputable knowledge and training center for those who wish to learn this ancient healing art. The Thai government regulates traditional Thai massage as it’s a major component of traditional Thai medicine. Unlike other types of relaxation massage, traditional Thai massage may be painful, at least in the beginning, as tension areas are identified and energy pathways unblocked using pressures and stretching. With repeated sessions, however, muscles and limbs loosen, making the massage a bit more bearable, and even something a customer looks forward to as tensions and aches in his or her body return. This also depends on the customer’s overall wellbeing, fitness levels, muscle ratio and flexibility. Around popular tourist areas in Thailand, such as Bangkok, Chiang Mai and Phuket, Thai massage may be offered with the use of oil, with stroking the dominant massage technique. Traditional Thai massage, however, does not use oil, and instead of gentle strokes and rubs, expect the masseuse to use squeezes, presses, bends and stretches to tease out your body’s hidden pain and relieve tension. The masseuse (Thai massage therapists are often women) employs various parts of her body to leave your lithe and limber. She will dig her stout thumbs hard into your palm, roll her forearms on both of your shoulders, and press her knees against your hamstrings as you lie on your back. She will put your foot on your opposite thigh then press you down on the floor, raise your leg towards the ceiling and push the ball of your feet while pulling in your thigh, and even climb on your lower back with her knees as you lie face down. With her assistance, you will be making what looks like impossible yoga-like positions. You will be bent and pulled and stretched in ways you cannot imagine achieving and may even hear a crick or a pop. This is nothing to be afraid of as your joints are being limbered up. Obviously, a firm, unshakeable surface is necessary to do these contortions. Expect to come out of a session feeling battered, beaten and limp (so don’t get a massage when you have just eaten). Your first traditional Thai massage will be anything but relaxing. You may even wince in pain as your body is contorted into shapes impossible to achieve without assistance. But after a good night’s sleep, expect to feel light, rejuvenated and full of positive energy. Once your body becomes accustomed to the stretches and acupressure from your first few sessions, you will begin to feel relaxed whenever getting a traditional Thai massage. Customers are welcomed into the massage shop with a warm water foot bath. The feet are then dried with a towel and may even be slathered with oils. The customer is often provided with slippers and airy, loose-fitting shirt and pants to change into before being led to a communal area (in the lower end massage shops) set up with firm mattresses laid on the floor and separated from the rest by curtains. In luxurious spas, your massage experience will altogether be in a different setting, with more privacy, soothing scents, and background music or sounds that will lull you into a temporary escape. At the end of the session, which could last from one to two hours depending on your choice, hot tea is served after changing back into street clothes. In traditional Thai massage shops, masseuses wear loose-fitting clothing similar to what they ask their customers to use, although their attires are both functional and decorative. Built-up tensions in the muscles can lead to knots and aches you never knew existed until teased out by pressure. Sometimes, these tensions can lead to painful breathing (especially if they are along the scapular area), recurring dull headaches if the tension is at the base of the nape, and lower back pain that won’t go away with medication. Pain sometimes remains unless the right kind of pressure is applied to targeted areas. All these muscular constrictions limit a person’s flexibility and range of movement, which Thai massage can restore after a series of treatments. Thai massage came out of the necessity to improve blood circulation among Buddhist monks who remain in one position for long periods. The same principle can be applied today to people who work in settings where assuming one position for a long time is part of their job. As in yoga, the benefit of traditional Thai massage is not only physical. It is not unusual to come out of an hour-long massage session with clear complexion, an even clearer mind, and a state of being that can only be described as blissful, with a kind of holistic energy and mental disposition that imbues a person with strength to face the challenges of day to day living. Because of the psychological sense of well being that traditional Thai massage brings, it may even be helpful for people suffering from depression to undergo massage therapy to complement their medical treatment. After all, massage therapy has been scientifically proven to reduce the level of stress hormone cortisol and increase the neurohormone oxytocin (otherwise known as the love hormone) which is released during sustained physical contact. As people suffering from depression usually lack the motivation to exercise, assisted yoga may just be what they need.